Guaranteed to melt…hearts! 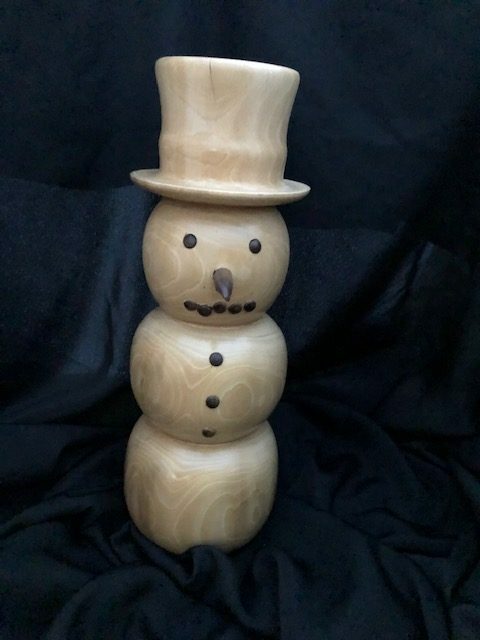 Solid wood with wooden buttons and facial features. We don’t put ours away after Christmas – they’ll make you feel cool in summer, too. 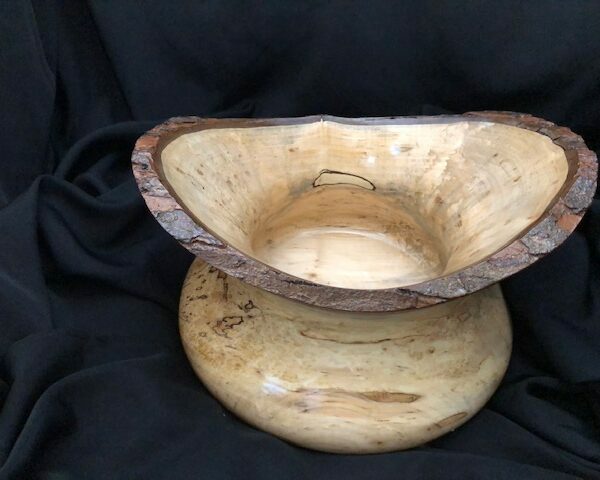 This spalted Pecan Tulip Vase is approximately 11″ wide and 10″ tall. It is reversed turned which means the wood has its natural edge (Bark) showing. The natural edge gives the vase an oblong appearance. It has an epoxy & lacquer finish. The wood was salvaged from a storm damaged pecan tree. It has species and branding information on the bottom. 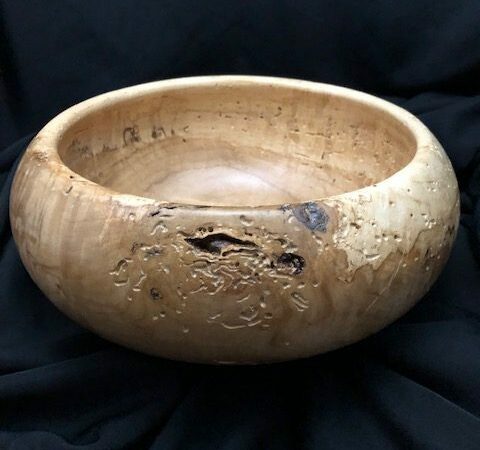 This spalted Maple bowl measures approximately 14″ wide and approximately 6″ high. It has an oil finish and is completely food safe. This piece is currently available. Please call for pricing. 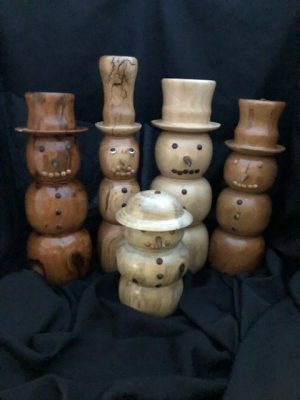 Each cowboy hat is unique, custom-crafted for every client. When turning a hat, the wood must be kept consistently wet, which means that finding just the right piece of wood can be difficult. The brim is then bent to a perfect angle and a leather band embellished with shotgun-shell tops is added, giving all our hats a truly authentic look. We add a silk lining, so you can even wear your hat! 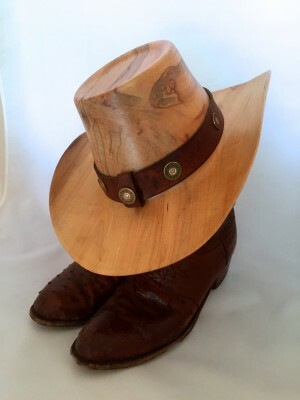 Please note: Our cowboy hats tend to have a lengthy lead time (approximately 2 months), allowing us to find just the right piece of wood. 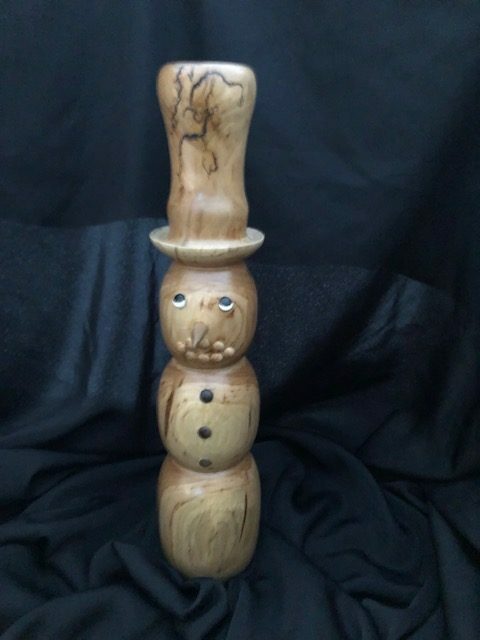 We also send you a head sizer so your hat can be sized to fit exactly. 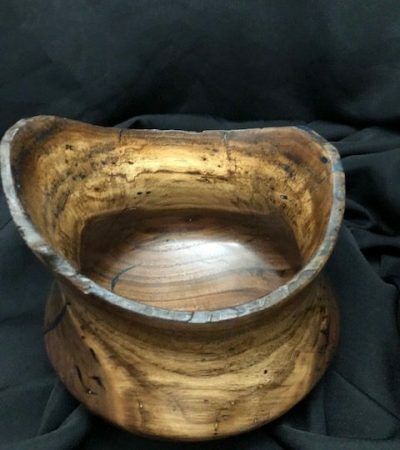 This spalted Maple Tulip Vase is approximately 14″ wide and 11″ tall. It is reversed turned which means the wood has its natural edge (Bark) still showing. The natural edge gives the vase a pleasing oblong appearance. It has an epoxy & lacquer finish. 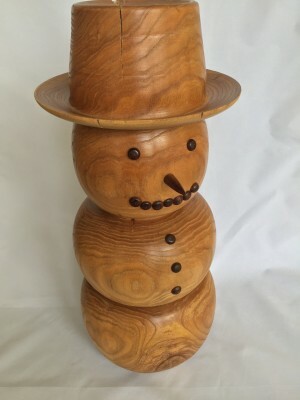 The wood was salvaged from a storm damaged pecan tree. It has species and branding information on the bottom. 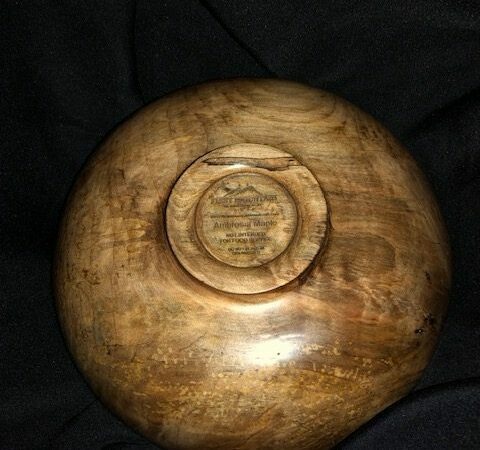 One of our most beautiful bowls. Sometimes you don’t know what is inside a piece of wood until you cut into it. In this case the wood was infested with worms that had left behind small tunnels and holes in the the wood. The piece was treated for the worms and what was left was ONE BEAUTIFUL PIECE OF WOOD! It is truly unique and loaded with character.